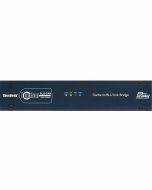 The BLU-160 has open architecture which is fully configurable through HiQnet London Architect. A rich palette of processing and logic objects and a "drag and drop" method of configuration provide a simple and familiar design environment. 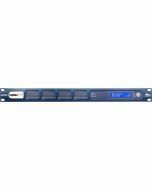 This processor features a low latency, fault tolerant digital audio bus of 256 channels which uses standard Category 5e cabling giving a distance of 100m between compatible devices. Fiber optic media converters can be used to increase the distance between devices to over 40km. 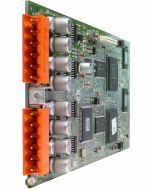 Four card slots facilitate many different device I/O configurations. 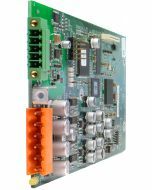 Each slot can accommodate any of six available I/O cards, including the Analog Input Card, Analog Output Card, Digital Input Card, Digital Output Card, AEC Input Card, and Telephone Hybrid Card. Each card supports four channels. 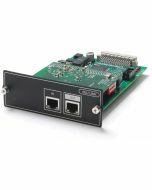 12 Control Inputs and 6 Logic Outputs allow the BLU-160 to be integrated with GPIO compatible devices.